The bowls season is now in full swing after one of the harshest winters in 30 years highlighted compaction and drainage problems on many bowling greens. Terrain Aeration has been to the rescue and David Green, the company's MD takes us to Wales, Sunderland and back, on an aeration journey that's kept him and his staff on the road during a busy three months. Here's his personal account. These bowls greens are in the higher parts of the South Wales valleys at heights reaching up to 750 feet above sea level in a cool and frequently cloudy area of very heavy rainfall. The greens were said to have improved immediately after they were treated and remained excellent for 6 years. After that they began to get wetter. Eventually they became too wet for the season's games and so we were called back to repeat our proven long lasting treatment. An unplayable green was treated in Sunderland, unplayable for five years because of water logging despite the costly installation of herringbone hard drainage. Terrain Aeration's Terralift machine cured that problem completely and the green is now in regular play. The process of installing the drainage system had badly scarred this green while our Terralift treatment left it practically undamaged and ready for immediate play. Let us not dismiss hard drainage as a waste of money because, in the case of one Welsh Valley green, the renovation of a hard drainage system in an adjacent football field has also cured the wetness problem of the bowls green. This was because the bowls green drainage system was still effective but simply could not drain into the common outfall because it was blocked. The renovation of the football field cleared the blockage and all we had to do was open up the soil on the green to allow the free flow of water into the drains. The whole system returned to full efficiency with spectacular results for the playing surface. The Terralifts' process is extremely effective. A hydraulic hammer is used to penetrate the compaction pan to one-metre depth. This is unique because other aeration machines simply push in their tines and solid compaction panning cannot be penetrated in this way. The tines merely 'bounce off' the hard layer. Once the Terralifts' one-metre probe is in the ground, compressed air up to a maximum of 20Bar is blasted through the end of it. This air pressure is required to break through the compaction pan and create fractures and fissures in the soil from one-metre down all the way to the surface. Only a small surface movement, more of a shudder than anything else, is just enough to let the operator know that the soil has been fractured from the one-metre depth. On the tail end of the air blast, dried milled seaweed is incorporated which sticks to the walls of the fractures and fissures, helping to keep them open longer. Over a period of time the seaweed swells and contracts with the moisture content in the soil. The probe is withdrawn and the process repeated using two-metre centre spacings on a staggered grid pattern. This ensures that each 'shot' is interconnected with the previous and surrounding 'shots'. The probe holes are backfilled with a porous aggregate to provide an aeration/ ventilation shaft feeding the airways with air and water. This aggregate is mower friendly whereas pea shingle would destroy mower blades. The top 50mm is topped with the top dressing already used on the green. A light mow picks up any loose materials and puts a nice stripe back onto the green - which is then ready to play on again. This process is not only used for pre-season or end of season maintenance - it is also used as a "Trouble-shooter", mid season, and has been used on bowling greens since 1987. Another bowling green in South Wales was suffering from black "squidge" and the bowlers found the footing very slippery. If the Terralift had not been used (in late June during the playing season) to aerate the green, the green would have been destroyed by the end of the season. Since the treatment took place the green has remained playable. The Airforce Scamper Terralift machine was designed specifically to gain access through most bowling green entrances. It has a separate engine/compressor unit so there is minimum weight to be manoeuvred on the green. Terrain Aeration also offer deep drill treatment for bowls greens and have had success with this process where the presence of shallow services beneath the green means the Terralift cannot be used. The deep drill literally drills 5/8" diameter holes 10" deep into the green. Sixty holes are drilled at 5" spacing and the process is repeated until the whole green has been completed. The spoil is brought to the surface by the drill flutes and can either be swept into the green or allowed to dry and cleared away. Top dressing is then drag matted into the holes and the green is left ready to play. 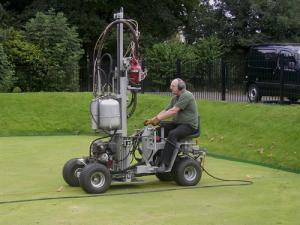 Greenkeepers can expect stronger root growth as a result of treatment. 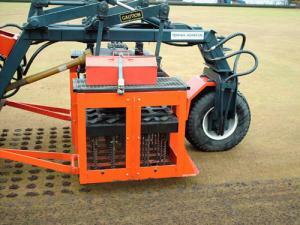 The Deep Drill has been used in the UK on bowling greens since 1992 when the machine first arrived from the USA. Access onto greens requires a minimum of 6ft 6in for this big but light footed three-wheeled turf-tyred machine."